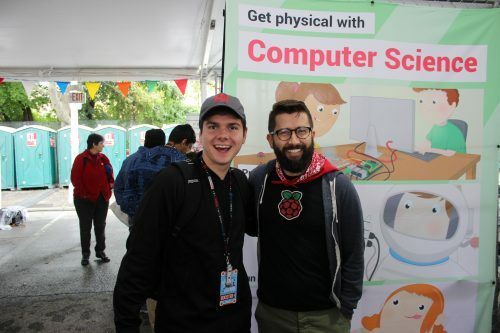 The Raspberry Pi Foundation loves to celebrate people who use technology to solve problems and express themselves creatively, so we’re proud to expand the incredibly successful event Coolest Projects to North America. This free event will be held on Sunday 23 September 2018 at the Discovery Cube Orange County in Santa Ana, California. Coolest Projects is a world-leading showcase that empowers and inspires the next generation of digital creators, innovators, changemakers, and entrepreneurs. The event is both a competition and an exhibition to give young digital makers aged 7 to 17 a platform to celebrate their successes, creativity, and ingenuity. 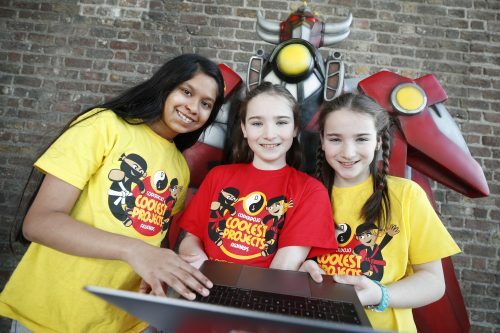 In 2012, Coolest Projects was conceived as an opportunity for CoderDojo Ninjas to showcase their work and for supporters to acknowledge these achievements. Week after week, Ninjas would meet up to work diligently on their projects, hacks, and code; however, it can be difficult for them to see their long-term progress on a project when they’re concentrating on its details on a weekly basis. Coolest Projects became a dedicated time each year for Ninjas and supporters to reflect, celebrate, and share both the achievements and challenges of the maker’s journey. 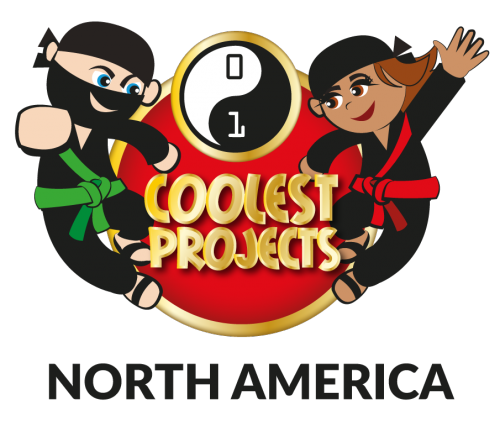 Not only is Coolest Projects expanding to North America, it’s also expanding its participant pool! 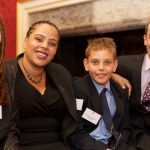 Members of our team have met so many amazing young people creating in all areas of the world, that it simply made sense to widen our outreach to include Code Clubs, students of Raspberry Pi Certified Educators, and members of the Raspberry Jam community at large as well as CoderDojo attendees. Coolest Projects is a free, family- and educator-friendly event. Young people can apply to exhibit their projects, and the general public can register to attend this one-day event. Be sure to register today, because you make Coolest Projects what it is: the coolest. The post Announcing Coolest Projects North America appeared first on Raspberry Pi. 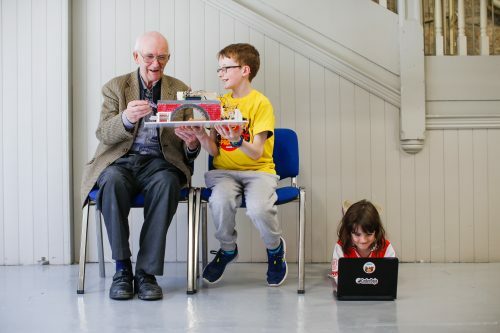 You can now sign up to our newest free online course Start a CoderDojo to learn more about CoderDojo and how you can easily set up one of these free coding clubs for young people in your area. With less than two weeks until the course begins, we wanted to tell you about the course’s content and why the course’s creator put it together for you. CoderDojo is a global network of free, volunteer-led, community-based programming clubs for young people aged 7 to 17. There are currently more than 1700 Dojos running regularly across 75 countries. All of these clubs were started by individuals who are passionate about giving young people the opportunity to learn to code. Some people assume you need technical skills to start a Dojo, but that’s not true. The most important thing is that you can bring people together for a shared goal. The course was developed by Philip, CoderDojo’s Educational Content Lead. It gives those who think empowering young people to be tech creators is important the resources and supports to achieve that goal by starting a Dojo. Divided over three weeks and running for about four hours in total, the course provides practical advice and resources on everything you need to know to plan and run a fun, social, and creative coding club for young people. Anyone interested in enabling young people to be tech creators should take this course. Parents, teachers, librarians, IT professionals, youth workers, and others have all started Dojos in their community. They say that “it’s an amazing experience that led [them] to expand [their] personal horizons”, and that they “find it really rewarding”. The course is free and open to all — if you’re interested, then sign up now. If you’re already mentoring at a Dojo, the course is a great opportunity to revise what you’ve learnt, and a chance to share your insights with newcomers in the discussion sections. Parents and guardians who wish to learn more about CoderDojo and are considering getting involved are also more than welcome to join. The post Start a CoderDojo with our free online training appeared first on Raspberry Pi. Each year we take stock at the Raspberry Pi Foundation, looking back at what we’ve achieved over the previous twelve months. We’ve just published our Annual Review for 2017, reflecting on the progress we’ve made as a foundation and a community towards putting the power of digital making in the hands of people all over the world. 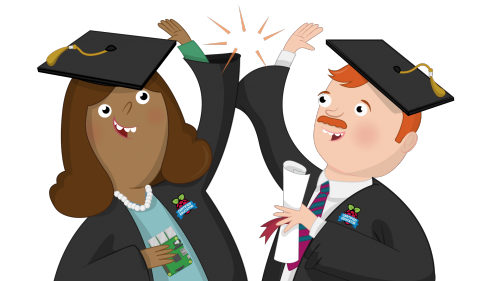 In the review, you can find out about all the different education programmes we run. Moreover, you can hear from people who have taken part, learned through making, and discovered they can do things with technology that they never thought they could. Our reach grew hugely in 2017, and the numbers tell this story. By the end of 2017, we’d sold over 17 million Raspberry Pi computers, bringing tools for learning programming and physical computing to people all over the world. 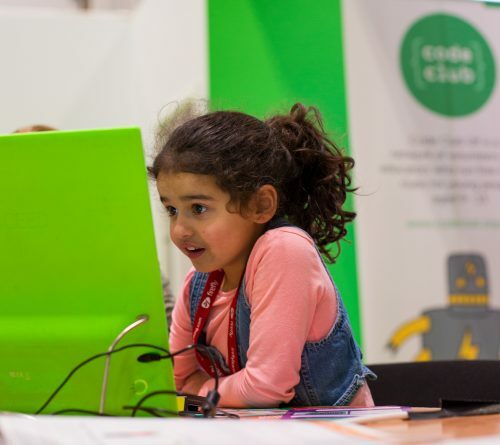 Code Club grew by 2964 clubs in 2017, to over 10000 clubs across the world reaching over 150000 9- to 13-year-olds. In 2017 CoderDojo became part of the Raspberry Pi family. Over the year, it grew by 41% to 1556 active Dojos, involving nearly 40000 7- to 17-year-olds in creating with code and collaborating to learn about technology. 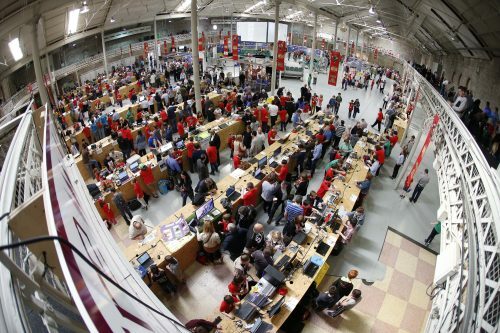 Raspberry Jams continued to grow, with 18700 people attending events organised by our amazing community members. We reached 208 projects in our online resources in 2017, and 8.5 million people visited these to get making. 2017 was also the year we began offering online training courses. 19000 people joined us to learn about programming, physical computing, and running a Code Club. Over 6800 young people entered Mission Zero and Mission Space Lab, 2017’s two Astro Pi challenges. They created code that ran on board the International Space Station or will run soon. 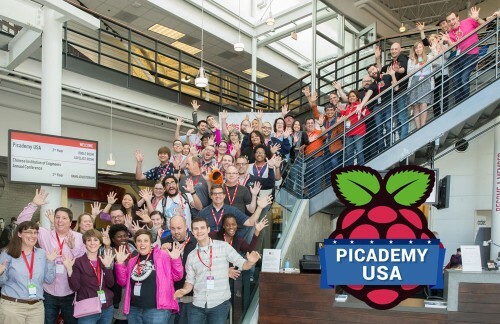 More than 600 educators joined our face-to-face Picademy training last year. 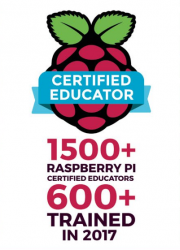 Our community of Raspberry Pi Certified Educators grew to 1500, all leading digital making across schools, libraries, and other settings where young people learn. 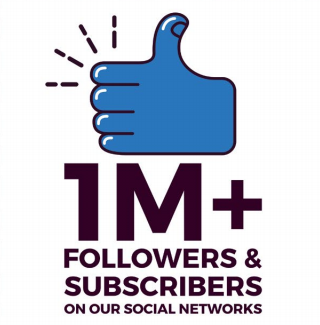 Well over a million people follow us on social media, and in 2017 we’ve seen big increases in our YouTube and Instagram followings. We have been creating much more video content to share what we do with audiences on these and other social networks. It’s been a big year, as we continue to reach even more people. This wouldn’t be possible without the amazing work of volunteers and community members who do so much to create opportunities for others to get involved. Behind each of these numbers is a person discovering digital making for the first time, learning new skills, or succeeding with a project that makes a difference to something they care about. You can read our 2017 Annual Review in full over on our About Us page. 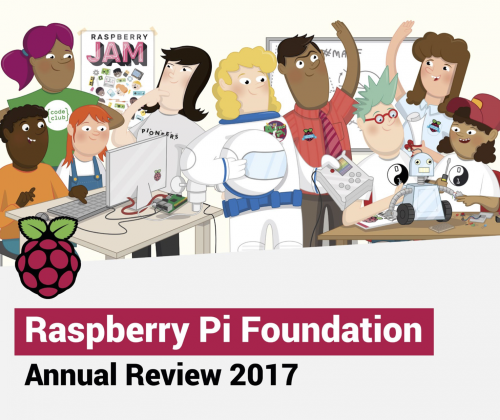 The post Our 2017 Annual Review appeared first on Raspberry Pi. time-tested and coherent frameworks for setting it up within a company of any size. a critic who pokes holes in other people’s designs. brace for our triumphant “I told you so” at some later date. at a technical solution – such as sharing a less sensitive subset of the data at hand. that we all make the same mistakes – and that not every solution that sounds good on paper is usable once we code it up. All security programs involve a good chunk of operational work. For product security, this can be a combination of product launch reviews, design consulting requests, incoming bug reports, or compliance-driven assessments of some sort. And curiously, such reactive work also has the property of gradually expanding to consume all the available resources on a team: next year is bound to bring even more review requests, even more regulatory hurdles, and even more incoming bugs to triage and fix. Being more tractable, such routine tasks are also more readily enshrined in SDLs, SLAs, and all kinds of other official documents that are often mistaken for a mission statement that justifies the existence of our teams. Soon, instead of explaining to a developer why they should fix a particular problem right away, we end up pointing them to page 17 in our severity classification guideline, which defines that “severity 2” vulnerabilities need to be resolved within a month. Meanwhile, another policy may be telling them that they need to run a fuzzer or a web application scanner for a particular number of CPU-hours – no matter whether it makes sense or whether the job is set up right. To run a product security program that scales sublinearly, stays abreast of future threats, and doesn’t erect bureaucratic speed bumps just for the sake of it, we need to recognize this inherent tendency for operational work to take over – and we need to reign it in. No matter what the last year’s policy says, we usually don’t need to be doing security reviews with a particular cadence or to a particular depth; if we need to scale them back 10% to staff a two-quarter project that fixes an important API and squashes an entire class of bugs, it’s a short-term risk we should feel empowered to take. As noted in my earlier post, I find contingency planning to be a valuable tool in this regard: why not ask ourselves how the team would cope if the workload went up another 30%, but bad financial results precluded any team growth? It’s actually fun to think about such hypotheticals ahead of the time – and hey, if the ideas sound good, why not try them out today? It can be difficult to understand if our security efforts are structured and prioritized right; when faced with such uncertainty, it is natural to stick to the safe fundamentals – investing most of our resources into the very same things that everybody else in our industry appears to be focusing on today. I think it’s important to combat this mindset – and if so, we might as well tackle it head on. Rather than focusing on tactical objectives and policy documents, try to write down a concise mission statement explaining why you are a team in the first place, what specific business outcomes you are aiming for, how do you prioritize it, and how you want it all to change in a year or two. It should be a fluid narrative that reads right and that everybody on your team can take pride in; my favorite way of starting the conversation is telling folks that we could always have a new VP tomorrow – and that the VP’s first order of business could be asking, “why do you have so many people here and how do I know they are doing the right thing?”. It’s a playful but realistic framing device that motivates people to get it done. In general, a comprehensive product security program should probably start with the assumption that no matter how many resources we have at our disposal, we will never be able to stay in the loop on everything that’s happening across the company – and even if we did, we’re not going to be able to catch every single bug. It follows that one of our top priorities for the team should be making sure that bugs don’t happen very often; a scalable way of getting there is equipping engineers with intuitive and usable tools that make it easy to perform common tasks without having to worry about security at all. Examples include standardized, managed containers for production jobs; safe-by-default APIs, such as strict contextual autoescaping for XSS or type safety for SQL; security-conscious style guidelines; or plug-and-play libraries that take care of common crypto or ACL enforcement tasks. Of course, not all problems can be addressed on framework level, and not every engineer will always reach for the right tools. Because of this, the next principle that I found to be worth focusing on is containment and mitigation: making sure that bugs are difficult to exploit when they happen, or that the damage is kept in check. The solutions in this space can range from low-level enhancements (say, hardened allocators or seccomp-bpf sandboxes) to client-facing features such as browser origin isolation or Content Security Policy. The usual consulting, review, and outreach tasks are an important facet of a product security program, but probably shouldn’t be the sole focus of your team. It’s also best to avoid undue emphasis on vulnerability showmanship: while valuable in some contexts, it creates a hypercompetitive environment that may be hostile to less experienced team members – not to mention, squashing individual bugs offers very limited value if the same issue is likely to be reintroduced into the codebase the next day. I like to think of security reviews as a teaching opportunity instead: it’s a way to raise awareness, form partnerships with engineers, and help them develop lasting habits that reduce the incidence of bugs. Metrics to understand the impact of your work are important, too; if your engagements are seen mostly as a yet another layer of red tape, product teams will stop reaching out to you for advice. The other tenet of a healthy product security effort requires us to recognize at a scale and given enough time, every defense mechanism is bound to fail – and so, we need ways to prevent bugs from turning into incidents. The efforts in this space may range from developing product-specific signals for the incident response and monitoring teams; to offering meaningful vulnerability reward programs and nourishing a healthy and respectful relationship with the research community; to organizing regular offensive exercises in hopes of spotting bugs before anybody else does. Oh, one final note: an important feature of a healthy security program is the existence of multiple feedback loops that help you spot problems without the need to micromanage the organization and without being deathly afraid of taking chances. For example, the data coming from bug bounty programs, if analyzed correctly, offers a wonderful way to alert you to systemic problems in your codebase – and later on, to measure the impact of any remediation and hardening work. If you’re an educator from the UK, chances are you’ve heard of Bett. For everyone else: Bett stands for British Education Technology Tradeshow. It’s the El Dorado of edtech, where every street is adorned with interactive whiteboards, VR headsets, and new technologies for the classroom. 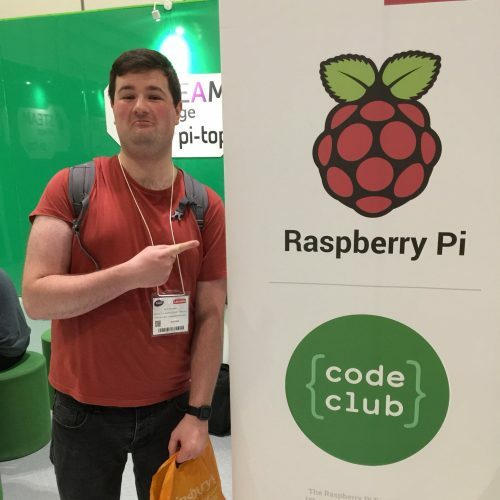 Every year since 2014, the Raspberry Pi Foundation has been going to the event hosted in the ExCeL London to chat to thousands of lovely educators about our free programmes and resources. Our setup this year consisted of four pods (imagine tables on steroids) in the STEAM village, and the mission of our highly trained team of education agents was to establish a new world record for Highest number of teachers talked to in a four-day period. I’m only half-joking. The best thing about being at Bett is meeting the educators who use our free content and training materials. 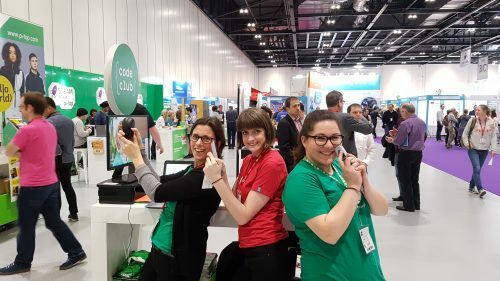 It’s easy to get wrapped up in the everyday tasks of the office without stopping to ask: “Hey, have we asked our users what they want recently?” Events like Bett help us to connect with our audience, creating some lovely moments for both sides. 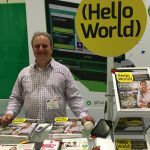 We had plenty of Hello World authors visit us, including Gary Stager, co-author of Invent to Learn, a must-read for any computing educator. More than 700 people signed up for a digital subscription, we had numerous lovely conversations about our content and about ideas for new articles, and we met many new authors expressing an interest in writing for us in the future. We also talked to lots of Raspberry Pi Certified Educators who we’d trained in our free Picademy programme — new dates in Belfast and Dublin now! — and who are now doing exciting and innovative things in their local areas. For example, Chris Snowden came to tell us about the great digital making outreach work he has been doing with the Eureka! museum in Yorkshire. The other best thing about being at Bett is running workshops for young learners and seeing the delight on their faces when they accomplish something they believed to be impossible only five minutes ago. 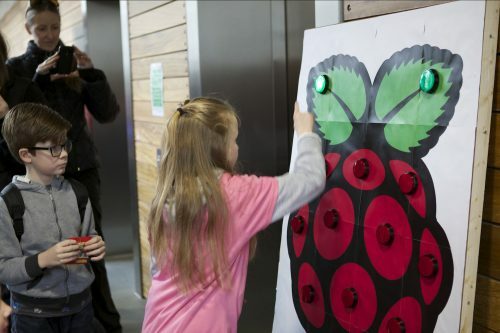 On the Saturday, we ran a massive Raspberry Jam/Code Club where over 250 children, parents, and curious onlookers got stuck into some of our computing activities. We were super happy to find out that we’d won the Bett Kids’ Choice Award for Best Hands-on Experience — a fantastic end to a busy four days. With Bett over for another year, our tired and happy ‘rebel alliance’ from across the Foundation still had the energy to pose for a group photo. 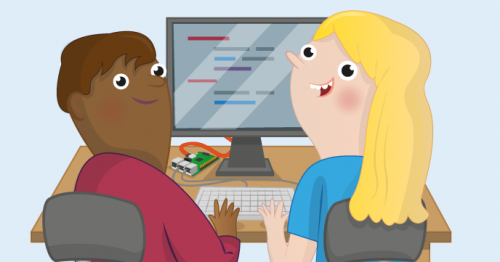 You can find out more about starting a Code Club here, and if you’re running a Jam, why not get involved with our global Raspberry Jam Big Birthday Weekend celebrations in March? We’ll be at quite a few events in 2018, including the Big Bang Fair in March — do come and say hi. 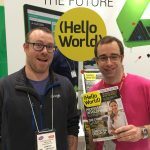 The post Four days of STEAM at Bett 2018 appeared first on Raspberry Pi. Interesting post-Snowden reading, just declassified. (U) NSA does not access everything. (U) NSA does not collect indiscriminately on U.S. Persons and foreign nationals. (U) NSA does not weaken encryption. (U) NSA has value to the nation. If you launch your startup and no one knows, did you actually launch? As mentioned in my last post, our initial launch target was to get a 1,000 people to use our service. But how do you get even 1,000 people to sign up for your service when no one knows who you are? There are a variety of methods to attract your first 1,000 customers, but launching with the press is my favorite. I’ll explain why and how to do it below. Social following: If you have a massive social following, those people are a reasonable target for what you’re offering. In particular if your relationship with them is one where they would buy something you recommend, this can be one of the easiest ways to get your initial customers. However, building this type of following is non-trivial and often is done over several years. 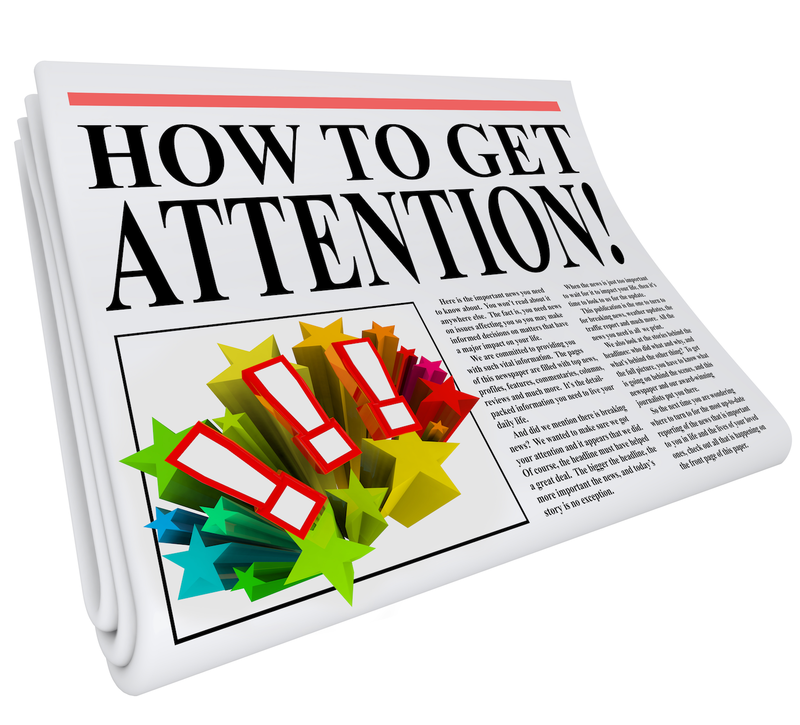 Paid advertising: The advantage of paid ads is you have control over when they are presented and what they say. The primary disadvantage is they tend to be expensive, especially before you have your positioning, messaging, and funnel nailed. Viral: There are certainly examples of companies that launched with a hugely viral video, blog post, or promotion. While fantastic if it happens, even if you do everything right, the likelihood of massive virality is miniscule and the conversion rate is often low. Press: As I said, this is my favorite. 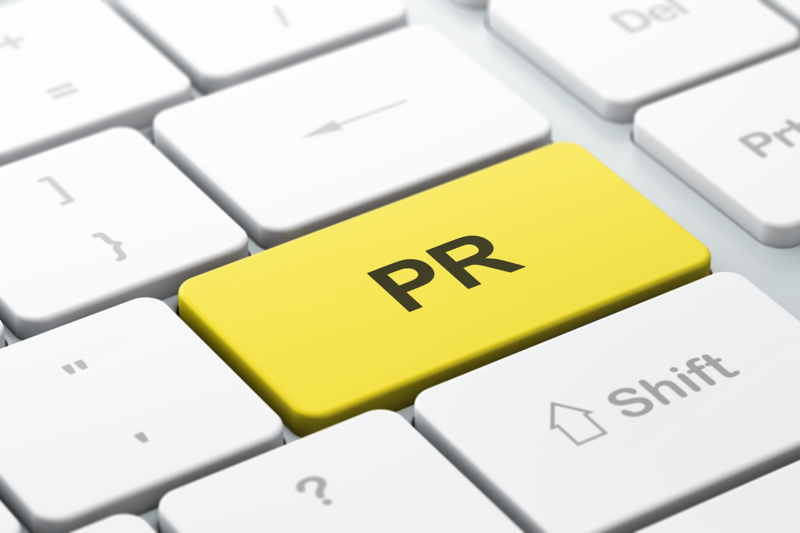 You don’t need to pay a PR agency and can go from nothing to launched in a couple weeks. 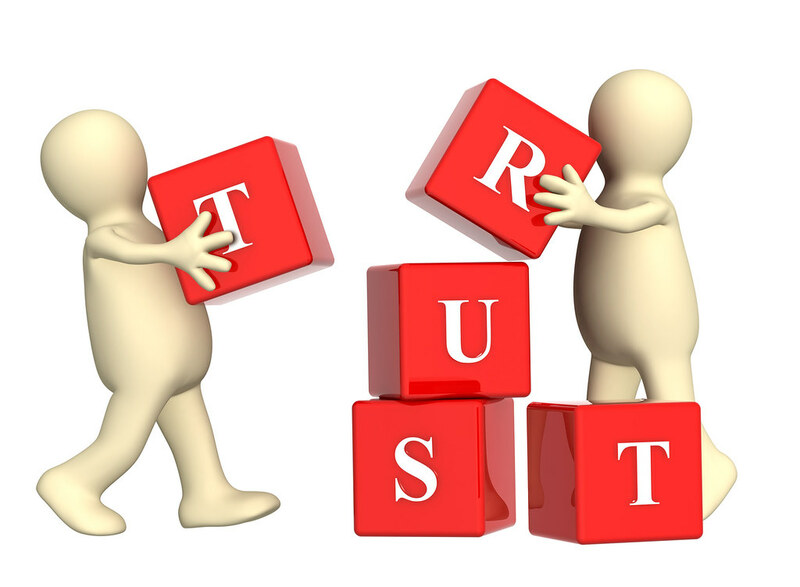 Press not only provides awareness and customers, but credibility and SEO benefits as well. It’s easy: Have a compelling story, find the right journalists, make their life easy, pitch and follow-up. Of course, each one of those has some nuance, so let’s dig in. What are we doing? What product service are we offering? Why? What problem are we solving? What is interesting or unique? Either about what we’re doing, how we’re doing it, or for who we’re doing it. Do you have an interesting investor or board member? Is there a personal story that drove you to start this company? Are you starting it in a unique place? Did you come upon the idea in a unique way? Can you share something people want to know that’s not usually shared? Are you partnered with a well-known company? Founded by serial entrepreneurs, bootstrapped a capital-intensive company, committed to each other for a year without salary. Challenging the way that every backup company before was set up by not asking customers to pick and choose files to backup. Designing our own storage system. For the initial launch, we focused on “unlimited for $5/month” and statistics from a survey we ran with Harris Interactive that said that 94% of people did not regularly backup their data. It’s an old adage that “Everyone has a story.” Regardless of what you’re doing, there is always something interesting to share. Dig for that. Once you’ve captured what you think the interesting story is, you’ve got to boil it down. Yes, you need the elevator pitch, but this is shorter…it’s the headline pitch. Write the headline that you would love to see a journalist write. Regardless of what you’re doing, there is always something interesting to share. Dig for that. Now comes the part where you have to be really honest with yourself: if you weren’t involved, would you care? One way I try to ground myself is what I call the “Techmeme Test”. Techmeme lists the top tech articles. Read the headlines. Imagine the headline you wrote in the middle of the page. If you weren’t involved, would you click on it? Is it more or less compelling than the others. Much of tech news is dominated by the largest companies. If you want to get written about, your story should be more compelling. If not, go back above and explore your story some more. Journalists write about news. Thus, if you’ve already announced something and are then pitching a journalist to cover it, unless you’re giving her something significant that hasn’t been said, it’s no longer news. As a result, there are ‘embargoes’ and ‘exclusives’. : An embargo simply means that you are sharing news with a journalist that they need to keep private until a certain date and time. If you’re Apple, this may be a formal and legal document. In our case, it’s as simple as saying, “Please keep embargoed until 4/13/17 at 8am California time.” in the pitch. Some sites explicitly will not keep embargoes; for example The Information will only break news. If you want to launch something later, do not share information with journalists at these sites. If you are only working with a single journalist for a story, and your announcement time is flexible, you can jointly work out a date and time to announce. However, if you have a fixed launch time or are working with a few journalists, embargoes are key. Exclusives: An exclusive means you’re giving something specifically to that journalist. Most journalists love an exclusive as it means readers have to come to them for the story. One option is to give a journalist an exclusive on the entire story. If it is your dream journalist, this may make sense. Another option, however, is to give exclusivity on certain pieces. For example, for your launch you could give an exclusive on funding detail & a VC interview to a more finance-focused journalist and insight into the tech & a CTO interview to a more tech-focused journalist. Call-to-Action: With our launch we gave TechCrunch, Ars Technica, and SimplyHelp URLs that gave the first few hundred of their readers access to the private beta. Once those first few hundred users from each site downloaded, the beta would be turned off. Thus, we used a combination of embargoes, exclusives, and a call-to-action during our initial launch to be able to brief journalists on the news before it went live, give them something they could announce as exclusive, and provide a time-sensitive call-to-action to the readers so that they would actually sign up and not just read and go away. “If a press release is published and no one sees it, was it published?” Perhaps the time existed when sending a press release out over the wire meant journalists would read it and write about it. That time has long been forgotten. Over 1,000 unread press releases are published every day. If you want your compelling story to be covered, you need to find the handful of journalists that will care. Once you’ve determined which publications cover your area, check which journalists are doing the writing. Skim the articles and search for keywords and competitor names. Over 1,000 unread press releases are published every day. Do they truly seem to care about the space? Do they write interesting/compelling stories that ‘get it’? Do they appear on the Techmeme leaderboard? Do their articles get liked/tweeted/shared and commented on? Do they have a significant social presence? In addition to Techmeme or if you aren’t in the tech space Google will become a must have tool for finding the right journalists to pitch. Below the search box you will find a number of tabs. Click on Tools and change the Any time setting to Custom range. I like to use the past six months to ensure I find authors that are actively writing about my market. I start with the All results. This will return a combination of product sites and articles depending upon your search term. Scan for articles and click on the link to see if the article is on topic. If it is find the author’s name. Often if you click on the author name it will take you to a bio page that includes their Twitter, LinkedIn, and/or Facebook profile. Many times you will find their email address in the bio. You should collect all the information and add it to your outreach spreadsheet. Click here to get a copy. It’s always a good idea to comment on the article to start building awareness of your name. Another good idea is to Tweet or Like the article. Next click on the News tab and set the same search parameters. You will get a different set of results. Repeat the same steps. Between the two searches you will have a list of authors that actively write for the websites that Google considers the most authoritative on your market. Your next step is to find the writers whose articles get shared the most socially. Go to Buzzsumo and click on the Most Shared tab. Enter search terms for your market as well as competitor names. Again I like to use the past 6 months as the time range. You will get a list of articles that have been shared the most across Facebook, LinkedIn, Twitter, Pinterest, and Google+. In addition to finding the most shared articles and their authors you can also see some of the Twitter users that shared the article. Many of those Twitter users are big influencers in your market so it’s smart to start following and interacting with them as well as the authors. Some journalists publish their contact info right on the stories. For those that don’t, a bit of googling will often get you the email. For example, TechCrunch wrote a story a few years ago where they published all of their email addresses, which was in response to this new service that charges a small fee to provide journalist email addresses. Sometimes visiting their twitter pages will link to a personal site, upon which they will share an email address. Of course all is not lost if you don’t find an email in the bio. There are two good services for finding emails, https://app.voilanorbert.com/ and https://hunter.io/. For Voila Norbert enter the author name and the website you found their article on. The majority of the time you search for an author on a major publication Norbert will return an accurate email address. If it doesn’t try Hunter.io. On Hunter.io enter the domain name and click on Personal Only. Then scroll through the results to find the author’s email. I’ve found Norbert to be more accurate overall but between the two you will find most major author’s email addresses. Email, by the way, is not necessarily the best way to engage a journalist. Many are avid Twitter users. Follow them and engage – that means read/retweet/favorite their tweets; reply to their questions, and generally be helpful BEFORE you pitch them. Later when you email them, you won’t be just a random email address. Now that you have all these email addresses (possibly thousands if you purchased a list) – do NOT spam. It is incredibly tempting to think “I could try to figure out which of these folks would be interested, but if I just email all of them, I’ll save myself time and be more likely to get some of them to respond.” Don’t do it. Follow them and engage – that means read/retweet/favorite their tweets; reply to their questions, and generally be helpful BEFORE you pitch them. First, you’ll want to tailor your pitch to the individual. Second, it’s a small world and you’ll be known as someone who spams – reputation is golden. Also, don’t call journalists. Unless you know them or they’ve said they’re open to calls, you’re most likely to just annoy them. Play the long game. You may be focusing just on the launch and hoping to get this one story covered, but if you don’t quickly flame-out, you will have many more opportunities to tell interesting stories that you’ll want the press to cover. Be honest and don’t exaggerate. When you have 500 users it’s tempting to say, “We’ve got thousands!” Don’t. The good journalists will see through it and it’ll likely come back to bite you later. If you don’t know something, say “I don’t know but let me find out for you.” Most journalists want to write interesting stories that their readers will appreciate. Help them do that. 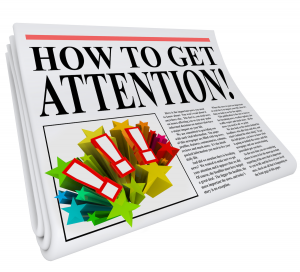 Build deeper relationships with 5 – 10 journalists, rather than spamming thousands. It doesn’t need to be complicated, but keep a spreadsheet that includes the name, publication, and contact info of the journalists you care about. 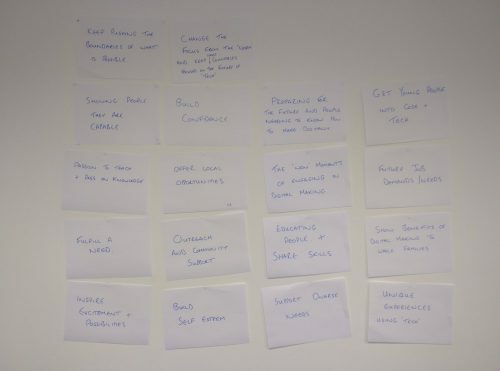 Then, use it to keep track of who you’ve pitched, who’s responded, whether you’ve sent them the materials they need, and whether they intend to write/have written. Journalists have a million PR people emailing them, are actively engaging with readers on Twitter and in the comments, are tracking their metrics, are working their sources…and all the while needing to publish new articles. They’re busy. Make their life easy and they’re more likely to engage with yours. Before sending them a pitch, know what they’ve written in the space. If you tell them how your story relates to ones they’ve written, it’ll help them put the story in context, and enable them to possibly link back to a story they wrote before. Journalists will need somewhere to get more info (prepare a fact sheet), a URL to link to, and at least one image (ideally a few to choose from.) A fact sheet gives bite-sized snippets of information they may need about your startup or product: what it is, how big the market is, what’s the pricing, who’s on the team, etc. The URL is where their reader will get the product or more information from you. It doesn’t have to be live when you’re pitching, but you should be able to tell what the URL will be. The images are ones that they could embed in the article: a product screenshot, a CEO or team photo, an infographic. Scan the types of images included in their articles. Don’t send any of these in your pitch, but have them ready. Studies, stats, customer/partner/investor quotes are also good to have. A pitch has to be short and compelling. Think back to the headline you want. Is it really compelling? Can you shorten it to a subject line? Include what’s happening and when. For Mike Arrington at Techcrunch, our first subject line was “Startup doing an ‘online time machine’”. Later I would include, “launching June 6th”. For John Timmer at ArsTechnica, it was “Demographics data re: your 4/17 article”. Why? Because he wrote an article titled “WiFi popular with the young people; backups, not so much”. Since we had run a demographics survey on backups, I figured as a science editor he’d be interested in this additional data. We’re launching Backblaze next week which provides a Time Machine-online type of service. As part of doing some research I read your article about backups not being popular with young people and that you had wished Accenture would have given you demographics. In prep for our invite-only launch I sponsored Harris Interactive to get demographic data on who’s doing backups and if all goes well, I should have that data on Friday. Next week starts Backup Awareness Month (and yes, probably Clean Your House Month and Brush Your Teeth Month)…but nonetheless…good time to remind readers to backup with a bit of data? Would you be interested in seeing/talking about the data when I get it? The Good: It said what we’re doing, why this relates to him and his readers, provides him information he had asked for in an article, ties to something timely, is clearly tailored for him, is pitched by the CEO and Co-Founder, and provides my cell. The Bad: It’s too long. Subject: Does temperature affect hard drive life? We’re going to publish the results this Monday, 5/12 at 5am California-time. Want a sneak peak of the analysis? A common question is “When should I launch?” What day, what time? I prefer to launch on Tuesday at 8am California-time. Launching earlier in the week gives breathing room for the news to live longer. While your launch may be a single article posted and that’s that, if it ends up a larger success, earlier in the week allows other journalists (including ones who are in other countries) to build on the story. Monday announcements can be tough because the journalists generally need to have their stories finished by Friday, and while ideally everything is buttoned up beforehand, startups sometimes use the weekend as overflow before a launch. The 8am California-time is because it allows articles to be published at the beginning of the day West Coast and around lunch-time East Coast. Later and you risk it being past publishing time for the day. We used to launch at 5am in order to be morning for the East Coast, but it did not seem to have a significant benefit in coverage or impact, but did mean that the entire internal team needed to be up at 3am or 4am. Sometimes that’s critical, but I prefer to not burn the team out when it’s not. Finally, try to stay clear of holidays, major announcements and large conferences. If Apple is coming out with their next iPhone, many of the tech journalists will be busy at least a couple days prior and possibly a week after. Not always obvious, but if you can, find times that are otherwise going to be slow for news. There is a fine line between persistence and annoyance. I once had a journalist write me after we had an announcement that was covered by the press, “Why didn’t you let me know?! I would have written about that!” I had sent him three emails about the upcoming announcement to which he never responded. My general rule is 3 emails. Ugh. However, my takeaway from this isn’t that I should send 10 emails to every journalist. It’s that sometimes these things happen. My general rule is 3 emails. If I’ve identified a specific journalist that I think would be interested and have a pitch crafted for her, I’ll send her the email ideally 2 weeks prior to the announcement. I’ll follow-up a week later, and one more time 2 days prior. If she ever says, “I’m not interested in this topic,” I note it and don’t email her on that topic again. If a journalist wrote, I read the article and engage in the comments (or someone on our team, such as our social guy, @YevP does). We’ll often promote the story through our social channels and email our employees who may choose to share the story as well. This helps us, but also helps the journalist get their story broader reach. Again, the goal is to build a relationship with the journalists your space. If there’s something relevant to your customers that the journalist wrote, you’re providing a service to your customers AND helping the journalist get the word out about the article. And finally, I’ll often send a short thank you to the journalist. As I mentioned at the beginning, there is more than one way to get your first 1,000 customers. My favorite is working with the press to share your story. If you figure out your compelling story, find the right journalists, make their life easy, pitch and follow-up, you stand a high likelyhood of getting coverage and customers. Better yet, that coverage will provide credibility for your company, and if done right, will establish you as a resource for the press for the future. Like any muscle, this process takes working out. The first time may feel a bit daunting, but just take the steps one at a time. As you do this a few times, the process will be easier and you’ll know who to reach out and quickly determine what stories will be compelling. The post How To Get Your First 1,000 Customers appeared first on Backblaze Blog | Cloud Storage & Cloud Backup. We at the Raspberry Pi Foundation find it incredibly rewarding to help people make and share things they love. It’s amazing to be part of an incredibly creative community of makers. 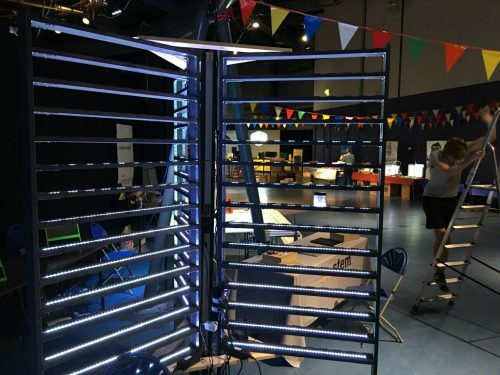 And we’re not the only ones who feel this way: for this year’s Maker Faire UK, the team over at NUSTEM created the Heart of Maker Faire, a Pi-powered art installation that is a symbol of this unique community. And to be perfectly frank, it’s bloody gorgeous. NUSTEM’s new installation for Maker Faire UK 2017, held on 1st & 2nd April at the Centre for Life, Newcastle-upon-Tyne. Visitors wrote notes about things they love, and sealed them in jars. They then read their heart rates, and used the control boxes to associate their jar and heart rate with a space on the shelves. NUSTEM is a STEM outreach organisation from Northumbria University, and the makers there are always keen to build interactive projects that get people excited about technology. So at this year’s Faire, attendees passing their installation were invited to write down something close to their heart, put that note in a jar, and measure their heart rate. Then they could connect their heart rate, via a QR code, to a space on a shelf lined with LEDs. Once they placed the jar in their space, the LEDs started blinking to imitate their heart beat. With this art piece, the NUSTEM team wants to say something about “how we’re all individuals, but about our similarities too”. Processing is an open-source programming language used to create images, graphs, and animations. It can respond to keyboard and mouse input, so you can write games with it as well. Moreover, it runs on the Pi, and you can use it to talk to the Pi’s GPIO pins, as the Heart of Maker Faire team did. Hook up buttons, sensors, and LEDs, and get ready to create amazing interactive pieces of art! If you’d like to learn more, read Matt’s blog post, or watch the talk he gave about Processing at our fifth birthday party earlier this year. Matt Richardson: Art with Processing on the Raspberry Pi Sunday 5th March 2017 Raspberry Pi Birthday Event 2017 Filmed and edited by David and Andrew Ferguson. This video is not an official video published by the Raspberry Pi Foundation. No copyright infringement intended. To help you get started, we’re providing a free learning resource introducing you to the basics of Processing. We’d love to see what you create, so do share a link to your masterworks in the comments! We’ll be attending World Maker Faire in New York on the 23rd and 24th of September. Will you be there? The post The Heart of Maker Faire appeared first on Raspberry Pi. and websites will be moved to static website hosting. some of the time is so great, why would you need anything more?”. in my view, must focus on that cause. just Conservancy’s mission, of course, it’s my personal one as well. work to our limits to meet the needs of our projects. enable us to focus our full-time efforts on the work of Conservancy. donation will be matched to make the funds go further. urgent they’ll be insurmountable by the time we focus on them. 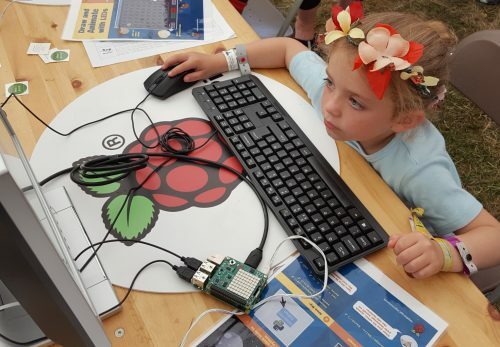 As well as working with classroom teachers and supporting learning in schools, Raspberry Pi brings computing and digital making to educators and learners in all sorts of other settings. I recently attended Wintercamp, a camp for Scouts at Gilwell Park. 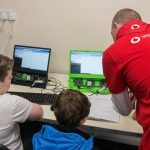 With some help from Brian and Richard from Vodafone, I ran a Raspberry Pi activity space introducing Scouts to digital making with Raspberry Pi, using the Sense HAT, the Camera Module, and GPIO, based on some of our own learning resources. Today I’m running @Raspberry_Pi activities for @UKScouting at @gpwintercamp with @VodafoneUK! Note the plastic sheeting on the floor! Kids were dropping into our sessions all day with muddy boots, having taken part in all sorts of fun activities, indoors and out. In the UK, the Scouts have Digital Citizen and Digital Maker badges, and we’re currently working with the Scout Association to help deliver content for the Digital Maker badge, as supported by the Vodafone Foundation. The activities we ran were just a gentle introduction to creative tech and experimenting with sensors, but they went down really well, and many of the participants felt happy to move beyond the worksheets and try out their own ideas. We set challenges, and got them to think about how they could incorporate technology like this into their Scouting activities. Having been through the Scouting movement myself, it’s amazing to be involved in working to show young people how technology can be applied to projects related to their other hobbies and interests. I loved introducing the Scouts to the idea that programming and making can be tools to help solve problems that are relevant to them and to others in their communities, as well as enabling them to do some good in the world, and to be creative. While conducting a survey of Raspberry Jam organisers recently, I discovered that a high proportion of those who run Jams are also involved in other youth organisations. Many were Scout leaders. Other active Pi community folk happen to be involved in Scouting too, like Brian and Richard, who helped out at the weekend, and who are Scout and Cub leaders. I’m interested to speak to anyone in the Pi community who has an affiliation with the Scouts to share ideas on how they think digital making can be incorporated in Scouting activities. Please do get in touch! The timing is perfect for young people in this age group to get involved with digital making, as we’ve just launched our first Pioneers challenge. There’s plenty of scope there for outdoor tech projects. Thanks to UK Scouting and the Wintercamp team for a great weekend. Smiles all round! The post Raspberry Pi at Scouts Wintercamp appeared first on Raspberry Pi. By any measure, the Raspberry Pi Foundation had a fantastic 2016. 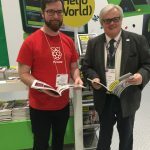 We ended the year with over 11 million Raspberry Pi computers sold, millions of people using our learning resources, almost 1,000 Certified Educators in the UK and US, 75,000 children regularly attending over 5,000 Code Clubs in the UK, hundreds of Raspberry Jams taking place all over the world, code written by schoolkids running in space (yes, space), and much, much more. As I’ve said before, what we achieve is only possible thanks to the amazing community of makers, educators, volunteers, and young people all over the world who share our mission and support our work. You’re all awesome: thank you. So here we are, just over a week into the New Year, and I thought it might be a good time to share with you some of what we’ve got planned for 2017. At the core of our mission is getting more young people excited about computing, and learning how to make things with computers. That was the original inspiration for the Raspberry Pi computer and it remains our number-one objective. One of the ways we do that is through Code Club, a network of after-school clubs for 9- 11-year-olds run by teachers and volunteers. 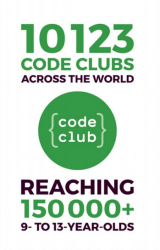 It’s already one of the largest networks of after-school clubs in the world, and this year we’ll be working with our existing partners in Australia, Bangladesh, Brazil, Canada, Croatia, France, Hong Kong, New Zealand, and Ukraine, as well as finding more partners in more countries, to bring Code Club to many more children. This year also sees the launch of Pioneers, our new programme for teen digital makers. It’s built around a series of challenges that will inspire young people to make things with technology and share their makes with the world. Check out the first challenge here, and keep watching the hashtag #MakeYourIdeas across your favourite social media platforms. UPDATE – The first challenge is now LIVE. Head here for more information https://www.youtube.com/watch?v=OCUzza7LJog Woohoo! Get together, get inspired, and get thinking. We’re looking for Pioneers to use technology to make something awesome. Get together in a team or on your own, post online to show us how you’re getting on, and then show the world your build when you’re done. We’re also expanding our space programme Astro Pi, with 250 teams across Europe currently developing code that will be run on the ISS by ESA French Astronaut Thomas Pesquet. And, building on our Weather Station project, we’re excited to be developing new ideas for citizen science programmes that get more young people involved in computing. British ESA astronaut Tim Peake is safely back on Earth now, but French ESA astronaut Thomas Pesquet is onboard the ISS, keen to see what students from all over Europe can do with the Astro Pi units too. 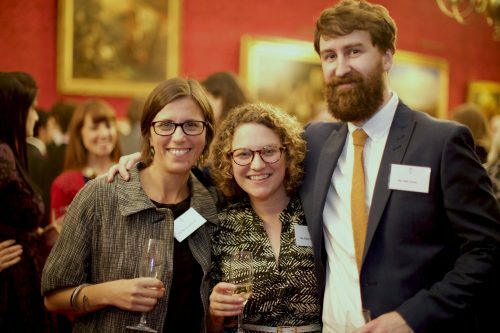 Another big part of our work is supporting educators who are bringing computing and digital making into the classroom, and this year we’re going to be doing even more to help them. 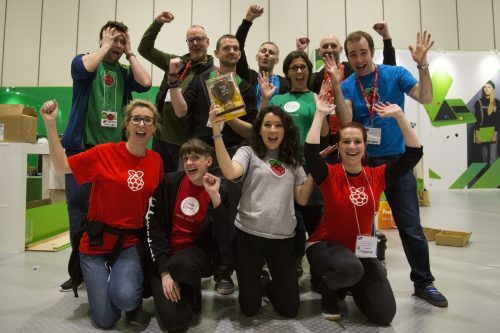 We’ll continue to grow our community of official Raspberry Pi Certified Educators, with Picademy training programmes in the UK and US. Watch out for those dates coming soon. We’re also opening up our educator training to a much wider audience through a series of online courses in partnership with FutureLearn. The first two courses are open for registration now, and we’ve got plans to develop and run more courses throughout the year, so if you’re an educator, let us know what you would find most useful. We’re also really excited to be launching a brand-new free resource for educators later this month in partnership with CAS, the grass-roots network of computing educators. For now, it’s top-secret, but if you’re in the Bett Arena on 25 January, you’ll be the first to hear all about it. 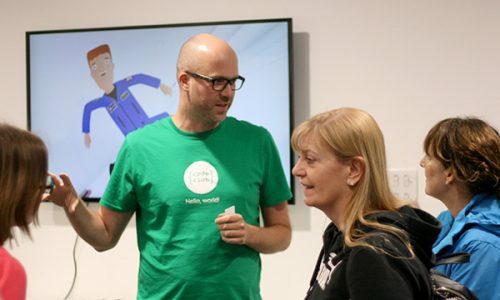 One of the most important things we do at Pi Towers is create the free educational resources that are used in Code Clubs, STEM clubs, CoderDojos, classrooms, libraries, makerspaces, and bedrooms by people of all ages learning about computing and digital making. 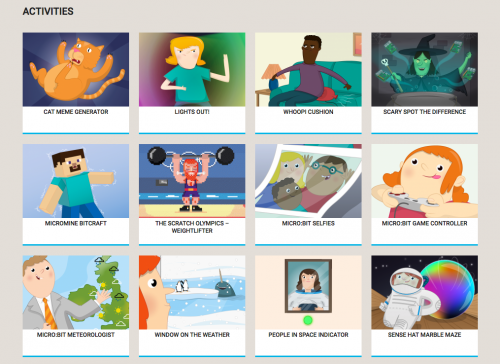 We love making these resources and we know that you love using them. This year, we want to make them even more useful. As a first step, later this month we will share our digital making curriculum, which explains how we think about learning and progression, and which provides the structure for our educational resources and programmes. We’re publishing it so that we can get feedback to make it better, but we also hope that it will be used by other organisations creating educational resources. We’re also working hard behind the scenes to improve the content and presentation of our learning resources. We want to include more diverse content like videos, make it easier for users to track their own progress, and generally make the experience more interactive and social. We’re looking forward to sharing that work and getting your feedback over the next few months. Last, but by no means least, we will continue to support and grow the community around our mission. We’ll be doing even more outreach, with ever more diverse groups, and doing much more to support the Raspberry Jam organisers and others who do so much to involve people in the digital making movement. The other big community news is that we will be formally establishing ourselves as a charity in the US, which will provide the foundation (see what I did there?) for a serious expansion of our charitable activities and community in North America. As you can see, we’ve got big plans for the year. Let me know what you think in the comments below and, if you’re excited about the mission, there’s lots of ways to get involved. 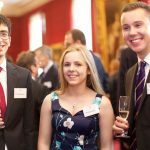 The post 2017: inspiring young makers and supporting educators appeared first on Raspberry Pi. This column is from The MagPi issue 51. You can download a PDF of the full issue for free, or subscribe to receive the print edition in your mailbox or the digital edition on your tablet. All proceeds from the print and digital editions help the Raspberry Pi Foundation achieve its charitable goals. Making things can change your life. It did for me, and I hear the same from others all the time. After I graduated from university in 2003, I jumped immediately into the workforce. I landed in New York City’s entertainment industry, which is where I’d dreamed of working since I was young. I was excited to be a staffer on a major television show, where I learned what it takes to produce a weekly drama series. I slowly worked my way up the ladder in the industry over a few years. There’s a lot to admire about how film and television content is produced. A crew of over one hundred people with creative and technical talents come together to create a piece of entertainment, under the watchful eye of the director. It’s an enormous piece of creative collaboration, but it’s also a business. Everyone does their part to make it happen. It’s incredible to see a show get made. I had found a niche in the television industry that I did well in, but eventually I hit a rut. I had a small role in a big piece of work. I wanted to be more creative, and to have more autonomy and influence over what I was helping to create. It was at that time that I started closely following what makers were doing. Feeling inspired by the work of others, I started to make things with microcontrollers and electronics. I’d then share information on how to recreate these projects online. Eventually, I was contributing projects to Make: magazine and I was soon able to make money from making things for companies, writing about how to make, and writing about what others were making. Soon enough, I was in a position to leave the television industry and work as a maker full-time. That eventually led to my current job, doing outreach for Raspberry Pi in the United States. It’s incredibly gratifying work and despite the long road to get here, I couldn’t be happier with what I’m doing. The spare time I invested in making things as a hobby has paid off greatly in a new career that gives me creative freedom and a much more interesting work day. Matt meets maker Gerald Burkett at World Maker Faire New York 2016. Because of more accessible technology like the Raspberry Pi and freely available online resources, it’s easier than ever to make the things that you want to see in the world. Whether you are a student or you are far down a particular career path, it’s easier than ever to explore making as a passion and, potentially, also a livelihood. If you’re reading this and you feel like you’re stuck in a rut with your job, I understand that feeling and encourage you to pursue making with vigour. There’s a good chance that what you make can change your life. It worked for me. The post Making life changes appeared first on Raspberry Pi. 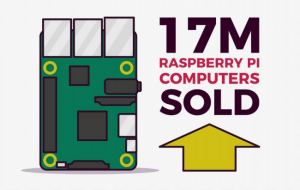 Last month, we celebrated the milestone of ten million Raspberry Pi computers sold to date. That’s quite extraordinary, and we’re thrilled to have reached so many people, not just through selling computers, but through our educational programmes and outreach activities. Our successes come in no small part from the support of our wonderful community, and we’d like to take this opportunity to thank you all for the great work that you do to further our mission to put the power of digital making in the hands of people around the world. One of the things I love most about our community is the mix of people from different backgrounds. 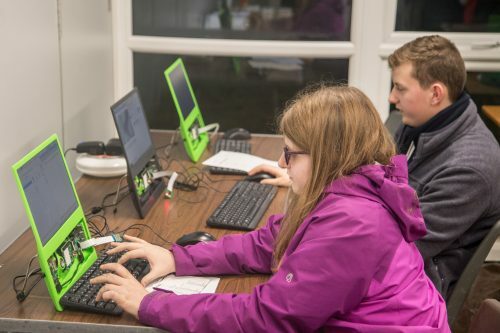 When Jams started to appear in mid-2012, all sorts of people came together to learn with Raspberry Pi: hardware hackers, software developers, electronic engineers, teachers, kids, parents, and grandparents. It’s our great privilege to have the Duke of York as Patron of the Raspberry Pi Foundation, and we benefit enormously from his support. On Wednesday evening, he kindly hosted an event at St. James’s Palace to celebrate the Raspberry Pi community. We couldn’t invite everybody we wanted to be there, but we were lucky enough to be able to share the evening with 150 community members. When we launched the first Raspberry Pi computer four-and-a-half years ago, we had very modest goals. Our founders wanted to inspire more young people to go to university to study computer science. Today, our reach is far greater, and we’re touching the lives of people of all ages in communities around the world. It’s amazing to reflect on how far we’ve come in such a short space of time: not only are we now the best-selling British computer in history, but we’ve made a real impact in education by making programmable computers affordable, training teachers, and providing free learning resources. Tens of thousands of young people have taken part in our educational programmes and competitions. 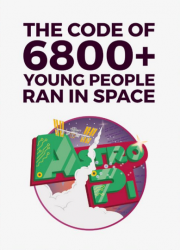 Astro Pi, our very own space mission, has seen young people from the UK design experiments and apps that have run on Raspberry Pi computers on the International Space Station; this marvellous feat will continue with our newly announced European-wide competition. Everybody in the community contributes in a different way. Whether they help run Raspberry Jams, CoderDojos or Code Clubs, write tutorials and lesson plans, share their projects on GitHub and social media, or create open-source software libraries, it all helps us reach more people. It’s amazing how something an individual can do, no matter how small it seems, can make such a big difference. I followed the Raspberry Pi blog through 2011 and bought a Pi on launch day. If you’d have told me that 5 years later my Python library would be in Eben’s top 5 software projects in The MagPi, I’d never have believed you! Thank you from all of us at the Foundation to everyone participating in activities which help us to extend the opportunity to learn computing and digital making to millions of people around the world. You really are making a big difference, and we’re incredibly grateful to have you all as part of our community. The post Celebrating our community! appeared first on Raspberry Pi. This is a guest post by Laxmikanth Malladi, Chief Architect at NorthBay. NorthBay is an AWS Advanced Consulting Partner. "Pay-for-performance" in healthcare pays providers more to keep the people under their care healthier. This is a departure from fee-for-service where payments are for each service used. Pay-for-performance arrangements provide financial incentives to hospitals, physicians, and other healthcare providers to carry out improvements and achieve optimal outcomes for patients. Eliza Corporation, a company that focuses on health engagement management, acts on behalf of healthcare organizations such as hospitals, clinics, pharmacies, and insurance companies. This allows them to engage people at the right time, with the right message, and in the right medium. By meeting them where they are in life, Eliza can capture relevant metrics and analyze the overall value provided by healthcare. This type of data has been characteristic and distinctive for Eliza and poses challenges in processing and analyzing. For example, you can’t have a table with fixed columns to store the data. The majority of data at Eliza takes the form of outreach results captured as a set of <attribute> and <attribute value> pairs. Other data sets at Eliza include structured data for the members to target for outreach. This data is received from various systems that include customers, claims data, pharmacy data, electronic medical records (EMR/EHR) data, and enrichment data. There are considerable variety and quality considerations in the data that Eliza deals with for keeping the business running. NorthBay was chosen as the big data partner to architect and implement a data infrastructure to improve the overall performance of Eliza’s process. NorthBay architected a data lake on AWS for Eliza’s use case and implemented majority of the data lake components by following the best practice recommendations from the AWS white paper "Building a Data Lake on AWS." This section highlights some of the transformations done to overcome the challenges related to data obfuscation, cleansing, and mapping. The following architecture depicts the flow for each of these processes. The Amazon S3 manifest file or time-based event triggers an AWS Lambda function. The Lambda function launches an AWS Data Pipeline orchestration process passing the relevant parameters. The Data Pipeline process creates a transient Amazon EMR resource and submits the appropriate Hadoop job. The Hadoop job is configured to read the relevant metadata tables from Amazon DynamoDB and AWS KMS (for encrypt/decrypt operations). Using the metadata, the Hadoop job transforms the input data to put results in the appropriate S3 location. When the Hadoop job is complete, an Amazon SNS topic is notified for further processing. When dealing with PII (Personally Identifiable Information) and PHI (Personal Health Information) data in non-production environments, the PII must be obfuscated or masked before it can be shared with the development teams. Considering the volume and velocity, the obfuscation itself becomes a big data problem. Eliza’s obfuscation strategy relies on creating an obfuscation for each of the 18-20 known PII data elements (such as names, date of birth, telephone number, etc.). The metadata required for the obfuscation process is stored in DynamoDB. The following table shows the sample schema and data related to this process. Some fields are obfuscated with dummy values, some fields with hash values. The fields which are present in the data file but not in this metadata table are not considered sensitive and are therefore not modified. The decision to hash some values allows these fields to join across multiple data sets as all similar fields across data sets are hashed using the same algorithm. The mapper part of the process reads the metadata from DynamoDB and creates an obfuscated line by going through each field and applying the corresponding obfuscation. The KMS kmsKeyId value is used, along with the actual value, to add an additional layer of complexity for the hashing algorithm. The obfuscation process is done per file and we chose to retain a one-to-one mapping of the original data file to the obfuscated output file. This brings additional challenges as the data may not enter with a standard format. An additional process has to be in place to cleanse the data and bring it to a common format. At Eliza, most of the field formats were already known and we were able to bring the data to a common format using the data cleansing technique mentioned later. The following table shows a sample definition and values for the metadata created in DynamoDB. The values in the InputRegex column define how the columns in different data sources should be treated. The schema structure allows you to apply multiple data cleansing rules on the same field and specifies the order of applying the rules. Mapping data allows you to combine data from multiple data sources efficiently. At Eliza, in the current implementation, we solved the problem of providing a common view across data sources with a known metadata or schema structure. For example, the fields Zipcode, Zip, zip-code, zip_code, zip4, etc. coming from different programs and data sources refer to the same piece of information called “Zip Code”. Ontology provides a process to build the common view when combining data from these different sources. At Eliza, based on the existing processes and knowledge of the current data sets, we were able to build a data mapping to consolidate fields across data sources. The following DynamoDB table shows a sample schema and values for storing the mapping metadata. AttributeValue in DynamoDB corresponds to the common field name that is used across multiple data sets. This table is read one time per data source and the information is stored in the source metadata. The source metadata is, in turn, read in the data processing Hadoop jobs while consolidating and transforming the data sets. From the given sample, MEMBERLANGUAGE, MEMBER_LANGUAGE, and PRIMARY_LANGUAGE are treated as the same attribute, “Language”. The consolidated data has only a canonical representation of the attributes derived through “attributevalue” from mapping the metadata table. An S3-based data lake is an architectural pattern strongly suited to the situation where data in an enterprise has a high variety and velocity with multiple consumption patterns. Due to the sensitive nature of the highly regulated healthcare information handled by Eliza, NorthBay found Eliza in need of a real-life data lake implementation. 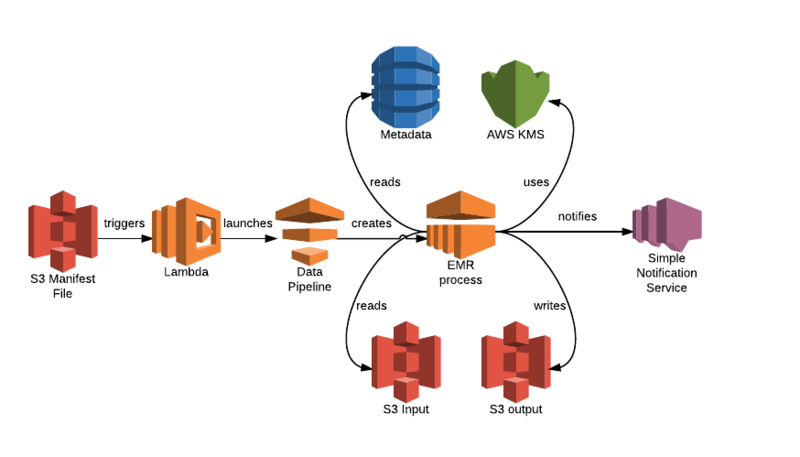 In the course of implementing the AWS-based data platform for Eliza, we discovered that, due to the nature of the sensitive healthcare information, certain situations can occur and there are effective ways to deal with them. While the implementation details are specific to healthcare, the high-level design was purposely built to be generic and applied across industries and enterprises. This content of this blog post will be included in an AWS Partner Webinar on Tuesday, October 18, 2016 featuring NorthBay and AWS. To register, click here. “Pay-for-performance” in healthcare pays providers more to keep the people under their care healthier. This is a departure from fee-for-service where payments are for each service used. Pay-for-performance arrangements provide financial incentives to hospitals, physicians, and other healthcare providers to carry out improvements and achieve optimal outcomes for patients. Laura Abbott marks the end of the latest round of open-source internships at Outreachy with a blog post reflecting on “what makes an internship successful,” especially as seen in the kernel team’s internships. Among Abbott’s lessons: “Choose your tasks carefully. Tasks with a specific goal but multiple ways to solve are best. Too open ended tasks can be frustrating for all involved but there should be some chance for decision making. Just giving a list of tasks and exactly how they should be completed isn’t good for learning. Give your intern a chance to propose a solution and then review it together.” Also: “Speaking of review, code review is a skill. Model how to respond to code review comments. Encourage interns to practice reviewing others code and ask questions as well.” That is just a sampling; in total, Abbott lists well over a dozen take-aways from the experience, all worth reading.